Hunting spiders easily climb vertical surfaces or move upside down on the ceiling. A thousand tiny hairs at the ends of their legs make sure they do not fall off. Like the spider's exoskeleton, these bristle-like hairs (so-called setae) mainly consist of proteins and chitin, which is a polysaccharide. To find out more about their fine structure, an interdisciplinary research team from the Biology and Physics departments at Kiel University and the Helmholtz-Zentrum Geesthacht (HZG) examined the molecular structure of these hairs in closer detail at DESY's X-ray light source PETRA III and at the European Synchrotron Radiation Facility ESRF. Thanks to the highly energetic X-ray light, the researchers discovered that the chitin molecules of the setae are specifically arranged to withstand the stresses of constant attachment and detachment. Their findings could be the basis for highly resilient future materials. They have been published in the current issue of the Journal of the Royal Society Interface. The tiny contact plates on the spider legs, which are only a few hundred nanometres in size, are subject to great forces when the spider is running or climbing. However, these adhesive structures easily withstand the heavy strain. "In comparison, artificially produced materials tend to break more often," says Stanislav N. Gorb from the Zoological Institute at Kiel University. "That's why we want to find out what makes spider legs so stable in resisting strong pull off forces." Together with the members of his "Functional Morphology and Biomechanics" working group, the zoologist investigates mechanisms of biological adhesion and how they could be transferred in artificial materials and surfaces. 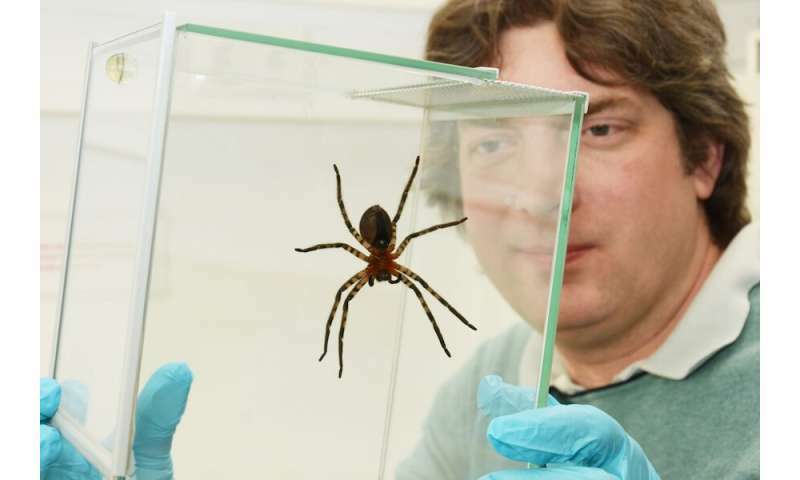 Gorb and his colleague, the zoologist and biomechanist Clemens Schaber, assumed that the secret behind the stability of spider adhesive hairs lies in the molecular structure of their material. Given the hairs' small dimensions in the lower micrometre range, however, it is impossible to investigate their molecular material architecture using conventional methods. These storage rings are among the best and most powerful X-ray sources in the world. And this is where the research team hit the spider material with X-ray beams. How exactly this radiation is scattered by the material provides insights of nanometre precision about the composition of the material. "This method revealed that the chitin molecules in the spider adhesive hairs have a very specific arrangement at the very tips of the hairs. The material of the tips strengthens the adhesive hairs in the direction of the pull off force because of the presence of parallel oriented chitin fibres," Müller said, summarising their findings. "Another remarkable insight is that the chitin fibres in other parts of the spider legs run in different directions. This structure, which is similar to plywood, makes the hair shaft stable in different directions of bending," explains Schaber, lead author of the study. The parallel alignment of the fibre molecules in the adhesive hairs, on the other hand, follows the traction and pressure forces acting on them. This structure allows the hairs to absorb the stresses that occur when the spider legs adhere and detach. "Nature uses different methods: biological materials and their structure grow simultaneously, while the steps involved in artificial production are sequential," said Gorb. New additive production technologies such as nanoscale 3-D printing may one day contribute to the development of completely new materials that were inspired by nature.